A great burger can be a hard thing to find which is why Granite City has perfected its handcrafter burgers in Troy. 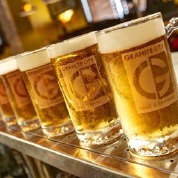 Granite City Food & Brewery in Troy offers a variety of great food options including our signature burgers. All of our burgers are served on a gluten-free bun and are served with your choice of kettle chips or coleslaw. You can customize your burger with a multitude of fresh ingredients that Granite City has available. Stop by Granite City Food & Brewery in Troy today and try one of our signature burgers. To learn more about Granite City’s food selection, including our handcrafted burgers in Troy, please call 248-519-1040. You can also reach one of Granite City’s knowledgeable representatives by simply filling out the form on the right side of this page. The quality of our burgers is guaranteed to satisfy any burger-lover because of the high-quality ingredients we use. When it comes to quality, we don’t cut corners at Granite City Food & Brewery in Troy. We take the time to ensure that your custom burger is made fresh to order every time. Check out the burgers we have to offer at Granite City Food & Brewery in Troy today. If you would like to know more about the craft beers and handcrafted burgers in Troy, call Granite City Food & Brewery today at 248-519-1040. You can also get in touch with one of our helpful associates by simply filling out the online request form on the right side of this page.